And the guest stars and cameos are impressive, too. You’ll find everyone from Friends’ Lisa Kudrow to Office Space’s Gary Cole, TV character actor staple Matthew Glave, Jones’ parents Peggy Lipton and Quincy Jones, and comedian Keegan-Michael Key, and even bigger comedic guns James Franco (probably the funniest cameo of them all) and Bill Murray. Maybe we’ll see Carol Burnett on a future episode? The music, sets, and camera angles all reflect what you’d find in a serious drama. It also makes the show work. But the world of Angie Tribeca is a askew. Way askew. The marathon was billed as commercial free, but as NBC’s Chuck managed with its in-show Subway promotions, Angie Tribeca found its way to include some fittingly over-the-top plugs to advertisers from Ford to Snickers. The one-time, day long adrenaline shot of humor only can leave us with withdrawals until Season Two arrives. How can we take this new binge-release norm we’re moving toward? It just leaves us hungry for more. 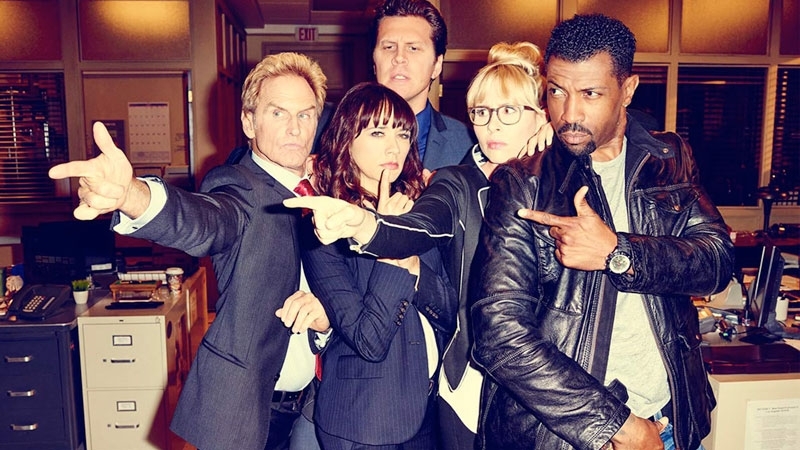 Until then we can just re-watch Angie Tribeca in its weekly slot beginning Monday nights, January 25, 2016. « First look–Is J.J. Abrams’ next Cloverfield his take on the Shyamalan thriller?